The independent and designer Emporium Hotel is all Ferrari-red and flamboyant chandeliers, with the lobby bar serving up cocktails in long-stemmed teacups, and a sleek rooftop pool overlooking the city. 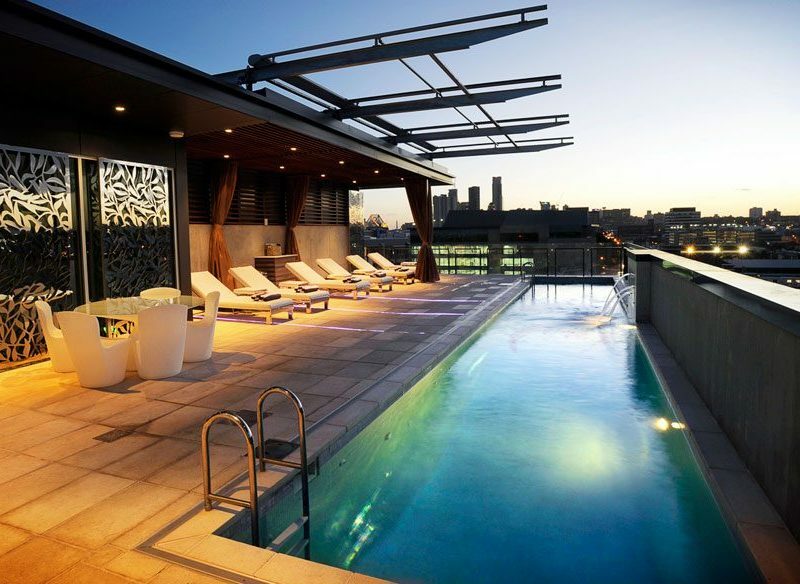 There’s no such thing as run-of-the-mill when it comes to luxury accommodation options in Brisbane. Brisbane is full of incredible accommodation options for anyone who pays a visit, but it’s the luxury options that are the best kept secret. From enhancing a summer holiday with chic interiors, to providing a lush homestead that will have you wanting to take the bed home with you, Brisbane is actually overflowing with luxury accommodation options. Tucked away in a quiet side street in New Farm, and housed across both a sweet Queenslander cottage and 1940s Art Deco apartment block, Spicers Balfour is more inner-city retreat than regular hotel. If you favour the personal touch, Spicers Balfour could be the spot for you. Tucked away in a quiet side street in New Farm, and housed across both a sweet Queenslander cottage and 1940s Art Deco apartment block, Spicers Balfour is more inner-city retreat than regular hotel. Carefully curated antique furniture and jewel-tone velvet chairs are paired with sumptuous bedding, rain showers and BOSE speakers in each room. But the real luxury here comes from feeling like you’ve been welcomed into a friend’s (expertly decorated) home. Gourmet breakfast, in-room Nespresso machines, sunset canapes on the rooftop, wi-fi and parking are all part of the service. From the moment the glass doors of the beautifully restored Art Deco elevator close and you ascend to your room at Ovolo Inchcolm, a feeling of calm washes over you. Manhattan meets Brisbane; that’s the best way to describe Ovolo Inchcolm. From the moment the glass doors of the beautifully restored Art Deco elevator close and you ascend to your room at Ovolo Inchcolm, a feeling of calm washes over you. The luxe decor, considered book selection surrounding the enormous flat-screen, and quirky touches like a stacked teapot and saucer lamp stand, all make this hotel feel anything but chain-brand. While style is clearly the number-one priority, it’s these extra thoughtful additions that give Ovolo Inchcolm a more relaxed vibe. Flamboyance in all the right places; if the Emporium’s walls could talk, that’s probably what they’d tell you – and no doubt they would have many a story to tell from almost 10 years of seeing Fortitude Valley’s new guard springing up around them. This independent designer abode away from home is all Ferrari-red and flamboyant chandeliers, with the lobby bar serving up cocktails in long-stemmed teacups, and a sleek rooftop pool overlooking the city. While the restaurant and shopping precinct within the Emporium complex is now more Guzman Y Gomez than Gucci, Tartufo is still its highly regarded Italian neighbour, and a short wander up the road will have you browsing Pottery Barn, sipping Campos coffee, and buying Ashton Kutcher’s favourite brownies at Dello Mano. At Alex Perry Hotel and Apartments, the design is spacious and inviting with textural neutrals and lashings of pewter and charcoal. From studio-style hotel rooms through to executive apartments, this is self-contained with style. Flamboyance in all the right places. When a fashion designer is behind the aesthetic, one would hope style would prevail. In the case of Australia’s Next Top Model judge and Mr Sunglasses, Alex Perry, his first foray into hotels, Alex Perry Hotel and Apartments, Fortitude Valley, would surely secure the model tick of approval. A GHD hair dryer and straightener sit hidden behind the mirrored bathroom cabinet, while a clothes steamer will have you red-carpet ready – after a stint at the rooftop pool, of course. The apartments themselves are spacious and inviting in textural neutrals with lashings of pewter and charcoal. Such is the secluded luxury of Nightfall’s handmade safari tents – positioned for optimal privacy beside gentle rapids and limited to only six travellers at any one time – that this campsite hidden in Lamington National Park books out months in advance (photo: Hannah Stratham). You want luxury, bush-style, and such is the secluded luxury of Nightfall wilderness camp’s handmade safari tents. Positioned for optimal privacy beside gentle rapids and limited to only six travellers at any one time – that this campsite hidden in Lamington National Park books out months in advance. The opportunity for a wilderness massage, days spent lounging around in hammocks slung between trees, or taking one of the Scenic Rim’s top walks through the Lost World Valley means you can be as active or passive as you please. Luxury is ingrained from the wire-brushed timber floor, to vintage bathtub and organic cotton bedding. You can self-cater or leave the menu up to hosts Heidi and Steve and enjoy their camp oven cuisine. Looking to plan a trip? Check out our handy guide on where to eat, stay and play in Brisbane.